We know he's the former FEMA guy—what about James Lee Witt's current business interests? 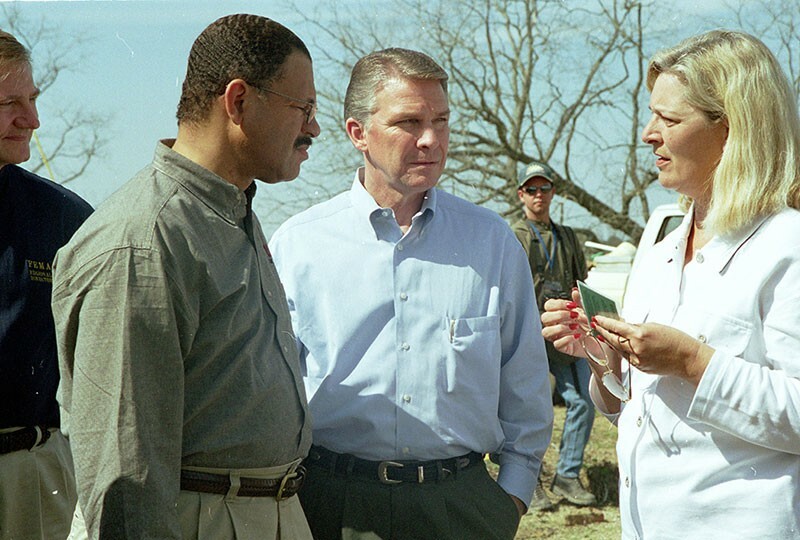 DISASTER ASSISTANCE James Lee Witt, center, and Congressman Sanford Bishop speak to a Georgia tornado victim in 2000 when he was FEMA director for Bill Clinton. James Lee Witt, the Bill Clinton–era Federal Emergency Management Agency administrator, was tapped in October to lead the fire-recovery nonprofit Rebuild North Bay. He headed FEMA in the 1990s, but more recently founded a corporation called EB5 Global Management, LLC, which seeks to capitalize on a controversial U.S. law that grants fast-track permanent residence status to foreign nationals in exchange for large investments in American development projects. The company has offices in Washington, D.C., and Little Rock, Ark., and was registered in Delaware in August 2015. According to its website, EB5 Global Management sets out to "form, fund and manage special purpose limited partnerships to loan money to companies creating jobs in the United States. We align the capital requirements of domestic developers and entrepreneurs with the immigration goals of our EB5 investors." Witt's firm accomplishes this goal by "coordinating the investment of foreign capital into development projects that are located within the United States in conformity with the requirements of the EB-5 Visa Green Card Program." EB-5 visas are granted to foreigners who make investments of at least $500,000 in areas with high unemployment or at least $1 million everywhere else, in exchange for a guarantee of 10 full-time jobs for every million dollars invested. Since its inception, the EB-5 program has been used to finance hotels, retail space, housing projects and numerous Las Vegas casinos. Regionally, the $6 billion Treasure Island development project now underway in San Francisco was undertaken with EB-5 loans provided to the Lennar Corporation, the nation's second-largest homebuilder. Rebuild North Bay is a 501(4)(c) nonprofit initiative launched by Darius Anderson, a prominent Sacramento lobbyist and real estate investor based in Sonoma who is also the managing partner of Sonoma Media Investments, the newspaper group which owns the Press Democrat. Anderson's lobbying clients on record with the state of California include Station Casinos, a Las Vegas corporation that manages the Graton Rancheria Casino in Rohnert Park. He also lobbies for Tesla General Motors and CannaCraft and Robertson's Ready Mix, one of the nation's largest concrete firms, which is owned by the Mitsubishi Materials Corporation. And Anderson's Kenwood Investments is a key development partner behind the eco-friendly Treasure Island project now underway. According to an August 2017 EB-5 project database compiled by the Center for Real Estate Finance Research at New York University, the Treasure Island development is funded, in part via $155 million in foreign loans provided to the Lennar Corporation to build a new community of 8,000 homes and hundreds of thousands of feet of new retail space. Will a Treasure Island–style project find purchase in the fire-scarred North Bay as it begins to rebuild? According to its website, "Rebuild North Bay will be led by an integrative team of community and business leaders focused on understanding what went right and what went wrong, while developing a comprehensive plan for recovery and rebuilding." the organization says it will eventually focus on a strategy for rebuilding, but doesn't yet offer any specifics about what shape that may take. Witt's office did not respond to a request for comment about his EB5 Global Management firm and what role it may play in Rebuild North Bay.